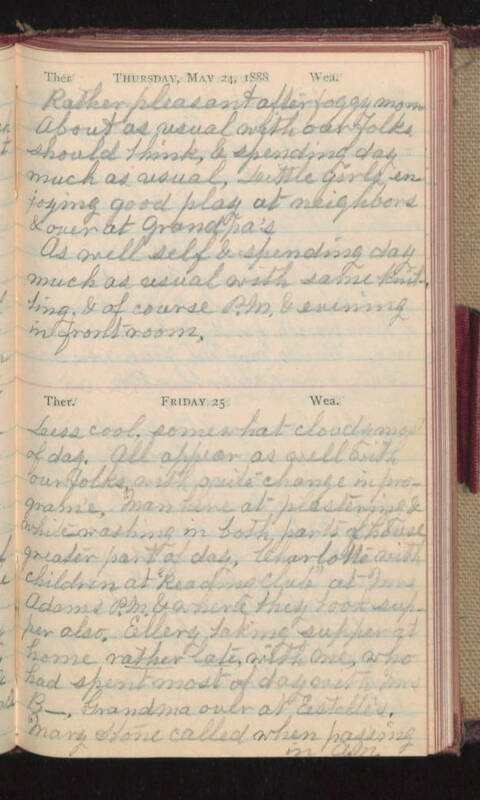 Thursday, May 24, 1888 Rather pleasant after foggy morn. About as usual with our folks should think, & spending day much as usual, Little girls enjoying good play at neighbors & over at Grandpa's As well self & spending day much as usual with some knitting, & of course P.M. & evening in front room. Friday 25 Less cool, somewhat cloudy most of day. All appear as well with our folks, with (spite?) change in program'e, Man here at plastering & white washing in both parts of house greater part of day, Charlotte with children at "Reading Club" at Mrs Adams P.M. & where they took supper also. Ellery taking supper at home rather late, with me, who had spent most of day with Mrs B-. Grandma over at Estelle's. Mary Stone called when passing in A.M.